An analysis of the stakes winners sired by the late Unusual Heat, the sire of He Be Fire N Ice, shows some significant patterns to follow when selecting mares for He Be Fire N Ice. 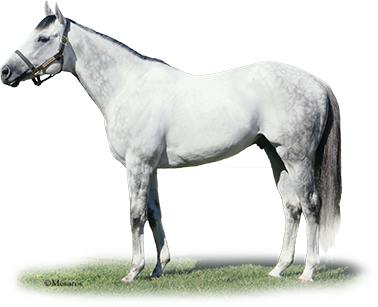 Mares carrying Mr. Prospector have done particularly well with Unusual Heat, producing 6 stakes winners – The Usual QT (Western Fame), Cheekaboo (Souvenir Copy), Twenty Hawks (Perfect Mandate), Boozer (Cape Canaveral), Huntsville (Jade Hunter), and Central Heat (Smart Strike). Look for mares carrying these stallions as well as Awesome Gambler, Candy Ride, Decarchy, Eddington, Midnight Lute, Papa Clem and Square Eddie as all of these should have an affinity for He Be Fire N Ice. It seems natural that mares carrying the sire of Mr. Prospector would also do well with Unusual Heat, and they have. Mares carrying Raise A Native have produced three (3) Stakes Winners by Unusual Heat and mares carrying Wavering Monarch have produced Stakes Winner Beltene. One would be wise to also consider the many daughters of Benchmark for He Be Fire N Ice. Unusual Heat sired G2 Winner Lethal Heat out of a Synastry (Seattle Slew) mare and Slew appears in five (5) other Unusual Heat Stakes Winners. In California it is easy to find Seattle Slew via Avenue of Flags, Event of the Year, General Meeting, Lucky Pulpit, Roi Charmant and Seattle Song. Likewise all mares carrying AP Indy should do very well with He Be Fire N Ice. Unusual Heat sired the stakes winner Pacific Heat from a Stormy Atlantic mare, so He Be Fire N Ice should do well with mares carrying Storm Cat. 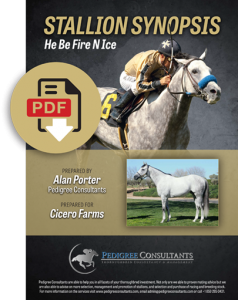 California sires Bluegrass Cat, Marino Marini, Sir Cat, Stormin Fever, Surf Cat and Yankee Gentleman provide numerous mares that should work well with He Be Fire N Ice. He Be Fire N Ice is by the late Unusual Heat, stakes winner of 6 races, $142,605, Amethyst S, Platinum S, Glencairn S, 2nd Coolmore Stud Home of Champions Concorde S (Ire-III), 3rd Ragusa Stud The Minstrel S. To October 31, 2015: Sired 15 crops, 712 foals, 527 rnrs (74%), 384 wnrs (54%), 52 2yo wnrs (7%), 50 sw (7%), 2.02 AEI, 1.25 CI, 99 sale yrlgs, avg $38,671, 0.87 TNA. In 2015: 40 2yos, 12 2yo rnrs, 5 2yo wnrs, 4 sw, 8 sale yrlgs, avg $40,275. Unusual Heat has sired Acclamation (champion older male, TVG Pacific Classic S, gr. IA, Eddie Read S, gr. IT twice, Charles Whittingham Memorial H, gr. IT three times, etc. ), The Usual Q. T. (Eddie Read S, gr. IT, Hollywood Derby, gr. IT, Oak Tree Derby, gr. IIT, Sir Beaufort S, gr. IIIT, John C. Mabee California Cup Mile H, 2nd Woodbine Mile S, Can-IT, etc. ), Unusual Suspect (Hollywood Turf Cup S, gr. IT, Hollywood Turf Express H, gr. IIIT, Cougar II H, Bay Meadows Derby, California Cup Mile H, TAB Werribee Cup, etc. ), Golden Doc A (Las Virgenes S, gr. IA, Anoakia S, Generous Portion S, 2nd Santa Anita Oaks, gr. IA, Stonerside Beaumont S, gr. IIA, Santa Ynez S, gr. IIA, etc. ), Miss Adela (Clasico Esmeralda, Mex-I, Clasico Monarca, 2nd Clasico Diamante, Mex-I, Clasico Gran Promesa, Mex-II, Clasico Revolucion, 3rd Clasico Batucada), Lethal Heat (Hollywood Oaks, gr. IIA, Santa Paula S, gr. IIIA, Real Good Deal S, Fleet Treat S, 2nd Lady’s Secret S, gr. IA, Palomar H, gr. IIT, etc. ), Tucked Away (Clement L. Hirsch H, gr. II, Solana Beach H, Fleet Treat S, Magali Farms S, 2nd A Gleam Invitational H, gr. II, Desert Stormer H, gr. III, etc. ), Gervinho (Sir Beaufort S, gr. IIT, Zuma Beach S, Oceanside S, 2nd Del Mar Derby, gr. IIT, Silky Sullivan S, 3rd Twilight Derby, gr. IIT), Pretty Unusual (El Encino S, gr. IIA, Melair S, 3rd Sunshine Millions Filly and Mare Turf S), Burns (La Jolla H, gr. IIT, 2nd Oceanside S), Lightmyfirebaby (Las Cienegas H, gr. IIIT, California Cup Distaff H, Irish O’Brien S, 2nd Valentine Dancer H, Solana Beach H, Work the Crowd S, etc. ), Bettys Bambino (Daytona S, gr. IIIT, Sensational Star S, to 5, 2015), Unusual Way (Breeders’ Cup Juvenile Filly Sprint Preview S, Wine Country Debutante S, Zia Park Oaks, Campanile S, 2nd San Clemente H, gr. IIT, Sunland Park Oaks, etc. ), Mensa Heat (On Trust H, Pirate’s Bounty S, 2nd Pirate’s Bounty S, 3rd Ancient Title S, gr. I, Palos Verdes S, gr. II, Eddie D Stakes, gr. IIIT, etc. ), Bel Air Sizzle (Melair S, Valentine Dancer H, 2nd Del Mar Oaks, gr. IT, Santa Ana H, gr. IIT, Honeymoon H, gr. IIT, 3rd Providencia S, gr. IIT, etc. ), Unusual Heatwave (Snow Chief S, Real Good Deal S, Crystal Water S, 2nd Tsunami Slew S, 3rd El Cajon S), Spenditallbaby (B. Thoughtful S, Fleet Treat S, 2nd Sharp Cat S, Solana Beach H, Cat’s Cradle H, It’s in the Air S, etc. ), Thermal Ablasion (Make Me Conquer S, Cordially S, 2nd Steve Van Buren H, Red Cross S, Justakiss S, HBPA City of Ranson H, etc. ), Lennyfromalibu (California Cup Mile H, Crystal Water H, 2nd TVG Khaled S, Sensational Star H), Unusual Hottie (Fran’s Valentine S, Redondo Beach S, 2nd Solana Beach H, American Beauty S, Osunitas S, Fran’s Valentine S, etc. ), Maui Mark (Donald Valpredo California Cup Sprint S), Surfcup (Snow Chief S, Silky Sullivan S, 3rd California Breeders Champion S, to 5, 2015), Boozer (California Flag H, 2nd California Cup Turf Classic S, etc., to 5, 2015), Scrofa (Irish O’Brien S, Work the Crowd H, etc. ), Medzendeekron (Crystal Water H, 3rd Commonwealth S, gr. IIA, etc. ), Mr. Chairman (California Cup Classic H, 3rd California Cup Starter H), Twenty Hawks (Governor’s Cup H, Winter H, to 8, 2015), Christiana’s Heat (Irish O’Brien S, 2nd Monrovia H, gr. IIIT, California Cup Distaff H, Wishing Well II H), Pass The Heat (Joseph T. Grace H, Bull Dog S, 3rd Berkeley S, gr. IIIA, Forty Niner S, March Madness H), Unusual Smoke (TVG Khaled S, 3rd Sunshine Millions Classic S), Lakerville (Clocker’s Corner S, 2nd San Simeon S, gr. IIIT, etc. ), Central Heat (Luther Burbank H, Golden Poppy S, 2nd Miss America S, to 6, 2015), America’s Friend (Solana Beach H, 3rd Dance in the Mood S), Heat Du Jour (Solana Beach H, to 5, 2015), Brushburn (March Madness Starter H, 2nd California Dreamin’ H, 3rd Charles Whittingham Memorial H, gr. IT), Ballistic Heat (SPRC Claiming Series Phase I S), Best Present Ever (Campanile S, 2nd John Deere California Cup Distaff S, 3rd American Oaks S, gr. IT), Unusual Jazz (March Madness Starter H), Juliesugardaddy (Harry Henson S, 2nd La Jolla H, gr. IIT, 3rd Oceanside S), Beltene (Sunshine Millions Oaks, 3rd Melair S), etc. Unusual Heat’s 2015 stakes winners are Central Heat, Bettys Bambino, Pacific Heat, He’s Very Rare. He Be Fire N Ice (Subject stallion). Zuri Mwana. 13 wins, 3 to 9, $207,326, Journal H, Spangled Jimmy H, 2nd Westerner H, 3rd Don Fleming H.
Aer Afrik. 9 wins, 3 to 6, $117,512, 3rd Thoroughbred 3,200 Claiming H.
Anga. 5 wins, 3 to 5, $75,618. Yo Syd. Winner at 3 and 4. Fleotan. 9 wins at 3 and 4, $101,380. Bandit’s Booty. 3 wins, 2 to 4, $35,974. Ruhlmiss. Winner at 4, $34,264. Producer. Arctic Gold Rush. 3 wins at 4 and 5, $27,156. Producer. Crafty Caper. 2 wins at 3. Silky Steel. 20 wins, 3 to 6, $178,802, Belle Roberts H, Carmel H, Brighouse Belles H, Cover Girl H, Rhododendron H, Fashion H, 2nd Ballerina H, Belle Roberts H twice, British Columbia Oaks H, Alki H, Brighouse Belles H twice, Vanity H, Seafair Queen S, 3rd Mercer Girls H. Producer. Granddam of Mahaska ($235,253, Chapman H, Bangles and Beads S, B. Thoughtful S, Senorita H, Puget Sound H, 2nd Las Cienegas H, Chapman H, Allez France H, 3rd Linda Vista Breeders’ Cup H, gr. III, Lafayette Breeders’ Cup H), Zashrany ($101,469, Rhododendron H, Fashion H, Ms. Stakes, Sweetheart H, 2nd Ellensburg Rodeo H, HBPA Breeders’ Cup Distaff H), Taj Aire ($92,597, Miss Yakima H). Tall Woods. 7 wins, 3 to 7, $72,766. Bondella. 6 wins, 3 to 6, $59,121. Dam of Pyrite Bonds ($89,875, Ohio Debutante H, 2nd Miss Ohio S). Vegas Ellie. Winner at 3, $31,200. Sheza Debbie. 3 wins, 2 to 4. Producer. Molten Steel. 10 wins, 3 to 7. Moonlately. 13 wins, 2 to 6, $228,150, Independence Day H, Space Needle H, Renton H, Yakima H, Penney H, Au Revoir H, Washington Championship S twice, Lewis and Clark H, B. Marcus Priteca S, 2nd Memorial Day H, Renton H, Space Needle H, Dan Castle H, Yakima H, 3rd Independence Day H, Tacoma H, Playfair Mile H twice, H.M.S. Chatham H, Evergreen H, Ellensburg Rodeo H, Lewis and Clark H, Silver Spur H.
Kings Faith. 7 wins, 3 to 5, $33,089, Washington State Breeders H, 3rd Governor’s Speed H.